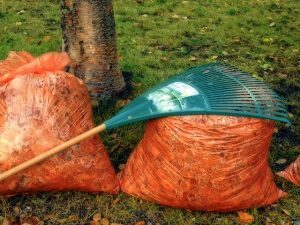 Many people may just bag up their leaves after raking and leave them for trash pick up. There are actually a few different ways you could recycle or reuse the leaves. Leaves are a great way to create free compost that you can use throughout the yard, garden, or flower beds once spring arrives. You can collect the leaves, along with some soil, in a bin or under a tarp to sit through winter. If you have a vegetable garden, you can rake leaves directly into the soil bed. Another option is to mulch the leaves as an alternative to wood mulch for your flower beds. If you don’t want to re-use the leaves in your own yard you could look into recycling them. Check your local community to see if anyone is looking for bagged leaves for composting. Your local schools may even need it for educational projects. Depending on where you live, the municipal waste services may collect landscape waste and take it to be recycled into mulch. Raking your leaves helps ensure that your grass and landscaping gets enough moisture and sunlight during the winter season. If you want your landscape to looks its best and give it a jumpstart for optimal growth in the spring, check with MDM Landscaping to find out which services are best to help your grass come in green and full next year. Services such as soil aeration and tree trimming can benefit your landscaping prior to cold weather setting in. Call us today at 817-396-0125 for more information about the landscaping and yard services we provide in Granbury, TX. Posted in Uncategorized on October 20, 2016 at 6:08 pm by MDM Landscapes.